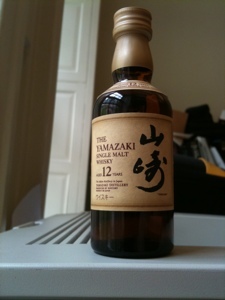 Yamazaki 12 is definitely a great whisky. 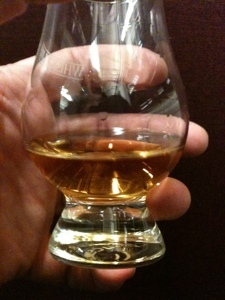 I tried a dram a few months ago and really enjoyed it. Interestingly I picked up some flavors and smells that I associate with spirits aged in small oak barrels, but I don't know if this is coincidence or if some of the barrels Suntory uses are smaller than the standard 53 gallons. Clearly I'll have to try it again to see if I find any of those characteristics on a second pass. I'll probably pick up a full bottle the next time I order from Hi-Time because it'll only be ~$40 with shipping, which is a pretty good deal period for a 12 year old single malt. Jordan, thanks for taking the time to read and comment. You always have extremely intelligent and insightful things to say. 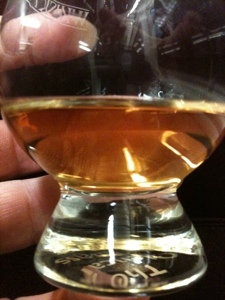 1) Great point about the flavor signature of small barrels. I have no idea if this is going on with Yamazaki, but it might explain how mature this whisky tastes at 12 years. I'll research the point. 2) Great point, too, about the value. K&L has Yamazaki 12 for $39.99. It's mid $40s here in NYC. That's fantastic value. "While we use American Oak, Spanish Oak and Japanese Oak in both age statements, they have a vastly different focus from each other. These are, very purposefully, different whiskies. I will leave the tasting notes to you but here are the technical differences. o The 12 yr is, obviously from color and nose, mostly American Oak, both ex-bourbon and new oak in the form of giant puncheon. We have our own cooperage so the puncheon are easy to come by for us. o The 18 yr on the other hand is mostly Spanish Oak. The color, the nose and the dry leave all point to this. · As for your reader that wonders about barrel size, we do not use anything smaller than the standard size. As a matter fact, we use a lot of very large barrels. Attached is a slide of the range we use." (I'll figure out how to put the PDF up - but it shows that all the casks used in the neighborhood of Hogshead on up to Puncheon. Yama 12 is a fun one for me. I think there's a bit of Japanese Oak influence at play on the spirit. To me, last I recall, it had a bit of pepper to the wood influence but it was balanced by some of the really well-done sweetness. Last I recall, the 18 was actually showing a little peat on it. It's been some time since I had it but I actually think it's one that works nicely as a highball. Yes, that heat is coming from the oak, no doubt. I know the French Sessle oak is what makes Compass Box Spice Tree and Oak Cross hot. I imagine that the Japanese oak is doing the same for Yamazaki 12. But, it is indeed the sweetness that you really remember. It's a great combo. I'll be trying the 18 soon. I don't think I'll make a highball - but that's a great tip if I do a full bottle. You know you're a real whisky maniac when you're making highballs with expensive exotic hooch like Yamazaki 18! Hey, it's just Yamazaki 18, not a '72 Caperdonich. ;) It's not an everyday thing but when it's right, it's right..
Yeah, your right. It's just whisky for heaven's sake. Where in the rule book does it say you MUST make a highball with $20 rye? Where, actually, is the rule book at all. I'm about to make a Manhattan and I'm going to use the best bourbon in the house. Why NOT a Yamazaki 18 highball? Admittedly, some of the best Manhattans out there are made with Rittenhouse Bonded, which is roughly $20. But those diamonds in the rough are few and far between. Josh, you know what is next up for you? Yamazaki 18yrs! Yamazaki 18 indeed. I have a sample on the way. The next review, however, is Hakushu 12 - the last Suntory 12 year old distillery expression. 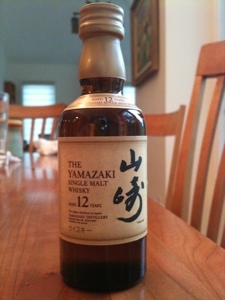 I just picked up a bottle of Yamazaki 12 in Berkeley at Ledger's on University. They have an astounding collection and Ed was incredibly nice and knowledgeable. K&L lists it for the best price, however $39.99.